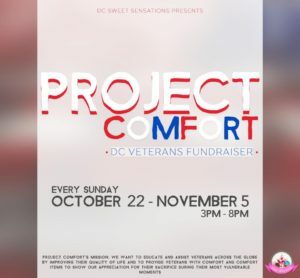 DC’s Sweet Sensations is bringing you Veteran’s Day Vibes “Project Comfort”, a fundraiser for veterans in DC! Join us every Sunday October 15th -November 5th from 3pm-8pm for a weekly social, product demonstrations and vendor expo with the local veteran community. Address will be sent to ticket holders only! Veterans are FREE to attend. General admission tickets only $4.20 for all others. Project Comfort Mission Statement: to educate and assist veterans across the globe by improving their quality of life and to provide veterans with comfort and comfort items to show our appreciation for their sacrifice during their most vulnerable moments.